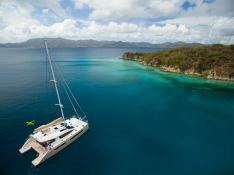 Xenia 50 is a magnificent Privilege Series 5 catamaran decorated and equipped to the highest standards and available for charter in the Caribbean. 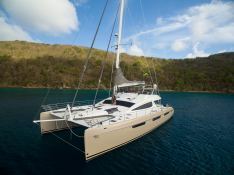 It should be noted that she is currently the only model of her type available for charter in the market. 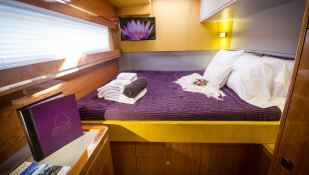 Xenia 50 offers three guest cabins each with a queen size bed and a private bath. 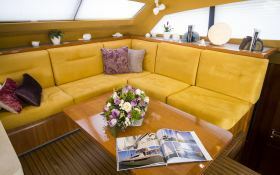 She has ample space in the living room, cockpit, lounge and upper deck. 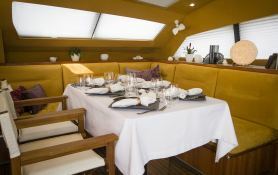 The lounge seats 6 for a formal dinner, seating for 6 for outdoor dining on the upper deck lounge and the front deck seating areas. 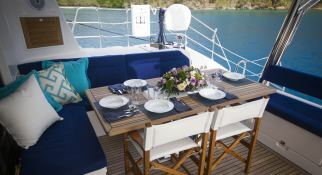 Fully air-conditioned, sailing with Xenia 50 is the guarantee to have a unique experience in the Caribbean. 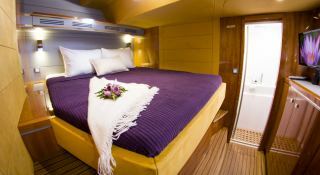 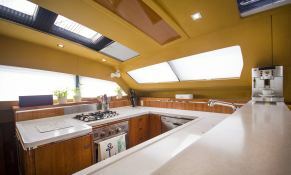 This crewed catamaran is available for yacht charter with a base price of 20 000 $ (approximatly 17 734 €).